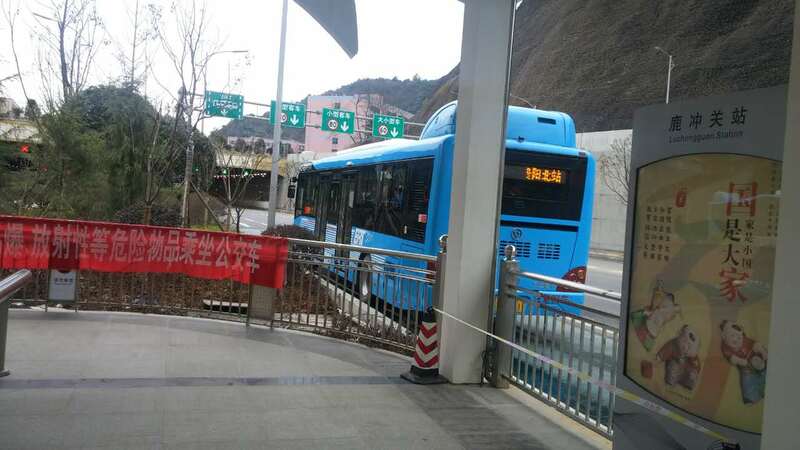 The BRT Bus Rapid Transit of Guiyang is a little bit like a subway, without the train. 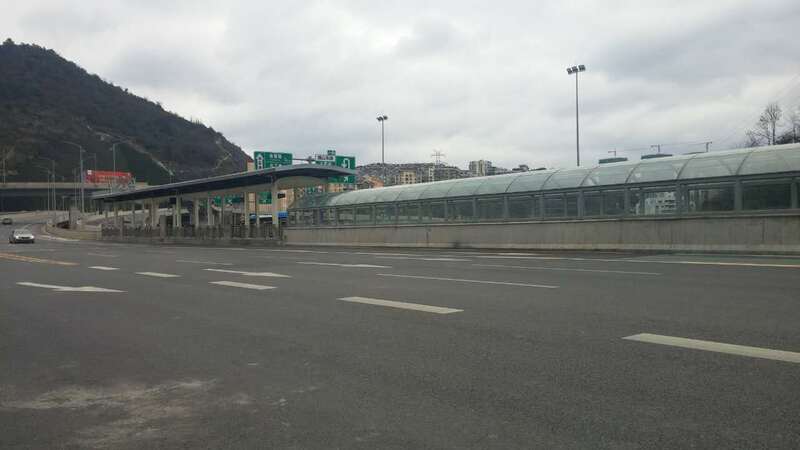 There is a ring road around Guiyang and during the construction there have been a lot of fairly substantial bus stations built in the center of the highway. Buses have a dedicated lane on the freeway and they stop at each station as if they were little subway cars. Access to the bus is restricted by sliding gate doors, not unlike what you see in the subways. BRT (Bus Rapid Transit) might be called BART or BERT if it were in a USA city, but it is a modern, low tech, solution to a significant congestion problem. Guiyang is prospering and everybody with any feeling of upward mobility needs to have a driver license. It’s a status thing. Of course, the roads can’t keep up with the rapid increase in the volume of cars. To make things a little worse, and a lot better, Guiyang is building subways through many of the most congested areas. During the construction, over the last couple years, several lanes of traffic have been closed off. It is big, “huge” construction. Right now (MAR 11), congestion is falling as subway construction is nearing completion and the BRT is picking up in popularity. It is my opinion that in another two years, Guiyang will be a highly convenient place to move around. Even those with cars should see some relief in congestion, but the bus/train solution is becoming increasingly competitive. The bus leaving the station. Note: I am standing in what would be “the median” of a freeway in the USA. I have just rented an apartment five minutes walk from the BRT bus station (Denggao Yunshan). This has given me a lot of flexibility in travel. If I want to go to the opposite side of this five million person city (Huaguoyan), I can just jump on the bus and be there in about twenty minutes. Normally by bus it takes an hour and a half, or more and by taxi nearly an hour. You can maybe double these numbers during rush hour traffic.The BRT gets bogged down in rush hour because some dirty lawbreakers use the dedicated bus lane for their Jags and Volvos, but it will only add about ten minutes to the trip. Transportation in Guizhou is improving rapidly. I recently went to downtown Guiyang (Guizhou Normal University) from Kaili in an hour and a half. 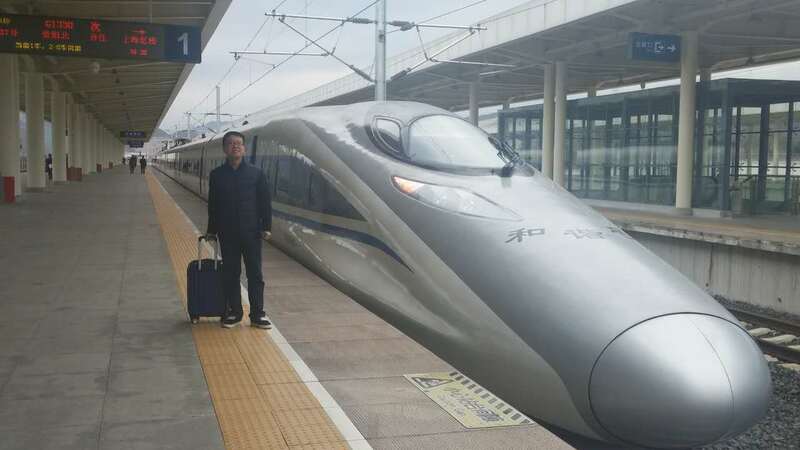 I got on the Gao Tia (bullet train) in Kaili at 2:35 pm and traveled at an average speed of 275 kilometers per hour (170 mph) and got off at 3:15 — maybe 120 miles. I caught the 262 bus to the University at 3:30 and arrived downtown at 4:00 pm.Going to Kaili was even easier with a BRT ride of 20 minutes and a 40 minute trip via Gao Tia. For those who want to go from one side of Guyang to the other, it’s a great solution. Going from Xintian Zhai to Huaguo Yuan can take one to two hours by bus or taxi. BRT takes 20 or 25 minutes. Bus 1 and Bus 2 go opposite directions around the circle. Bus 3 is a bit faster because it doesn’t go to the North Rail Station (Beizhan). (Bus 3 begins and ends at the “Future Ark” development.) The best way to think of the Gao Tia is like a wheel, with the old bus routes as the spokes of the wheel that allow you to go to toward the city center.